There’s been a disturbance in the Force. EA unveiled the first look at its upcoming Star Wars game, Jedi Fallen Order, at the Star Wars Celebration in Chicago on Saturday afternoon. Fallen Order is a single-player game following an original story set in the Star Wars universe. Head of Respawn, Vince Zampella, kicked off the panel by noting, “Star Wars is part of my DNA.” He then noted that the game will be story-driven and will not feature multiplayer or microtransactions. “It’s about being a Jedi,” he told the crowd, to great applause. The game’s story follows a young Padawan who survived Order 66, a secret missive from the Empire that led to the near total extermination of the Jedi. It will introduce a number of new planets and characters to the Star Wars universe. A short trailer for the game showed off the new hero, Cal Kestis. “There are three rules to survive: don’t stand out, accept the past and trust no one,” he says. Stormy planets are shown along with large set pieces and Empire droids and Storm Troopers searching for Cal. A dark-armored warrior, dubbed the Second Sister Inquisitor, was a focal point of the trailer, seemingly as a primary antagonist, and was also revealed to be a Force user. Another new character was BD-1, a droid who is “best friends” with Cal. Force powers, blaster shootouts and light saber duels are also highlighted. Cal is played by Gotham and Shameless star Cameron Monaghan, who joined the panel. “It’s no big deal, it’s only every kid’s dream ever to be a Jedi,” said Monaghan of the role. “We always said we wanted someone with a young Clint Eastwood quality, and that’s what we got,” said game director Stig Asmussen of Monaghan. “He’s ultimately a very good-hearted person, even though he’s been through so much tragedy,” Monaghan said of Cal. Cal’s light saber, meanwhile, is shrouded in mystery. “Over the course of the game, it will grow and evolve,” said Asmussen. The game has been hotly anticipated. During an earnings call in February, EA promised Fallen Order would launch this fall. It is being developed by Apex Legends and Titanfall studio Respawn Entertainment. “I can tell you I’m super confident that we’re on to something,” Asmussen promised the crowd. EA has had an exclusive publishing deal for Star Wars games with Disney since May 2013. The partnership is slated through 2023. In that past six years since inking the agreement, however, only two major Star Wars titles have been released by EA: 2015’s Star Wars Battlefront and 2017’s Star Wars Battlefront II. While the first game met sales expectations, the second was a commercial failure and sparked significant fan backlash for its inclusion of “loot boxes,” optional purchasable in-game upgrades that fans said made the game incredibly difficult to succeed in without buying them. 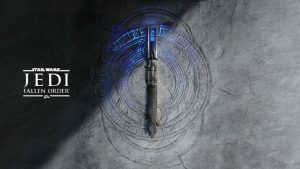 Star Wars: Jedi Fallen Order will release on Nov. 15 on Xbox, PlayStation and PC.